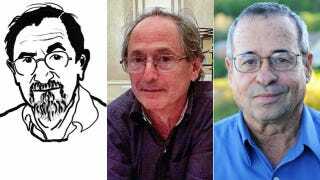 Chemists Awarded Nobel Prize for "Taking Experiments to Cyberspace"
The 2013 Nobel Prize in Chemistry has been awarded to Martin Karplus, Michael Levitt and Arieh Warshel for their contributions to the development of powerful computer programs that model complex chemical systems. Above, from left to right: Karplus, Levitt and Washel. "Chemists used to create models of molecules using plastic balls and sticks. Today, the modelling is carried out in computers," the Royal Swedish Academy of Sciences said in a statement. "The computer is just as important a tool for chemists as the test tube. Computer models mirroring real life have become crucial for most advances made in chemistry today." Here's the gist: Computer simulations of chemical interactions have become standard practice in everything from drug design to models of biochemical process in living organisms. But the transition from physical experiments to accurate theoretical modeling has not been easy. The ability to perform these simulations has required the combination of classical- and quantum-mechanical theories of chemical interaction – the former being used to model interacting atoms, the latter to model the electrons and atomic nuclei of those atoms. To merge the quantum world with the classical one, as any physicist will tell you, is no mean feat. Karplus, Levitt and Warshel have been awarded the Nobel Prize for their contributions to computer models that enable chemists to bridge this gap.